The sports teams I root for don’t win all that much. I know this may shock you being from a championship-rich city like Philadelphia (that’s sarcasm). Alas, I still find a way to root for my big 4 – the Phillies, Sixers, Eagles and Flyers. Couple that with my fandom of a few soccer teams to go along with everything Penn State & The University of Texas and I’ve done a lot of rooting with not a lot of results. So how do I continue to root for the home team despite their losing ways? Let’s find out. While I have absolutely zero experience in the parenting world, I have to imagine rooting for a bad home team is like supporting your B-student child who wants to apply to Harvard. You know damn well the outcome won’t be positive, but you’re gonna support them all the way and stubbornly prove every naysayer wrong. While I wouldn’t suggest using any of my team-rooting methods below to parent, except maybe the third one, I do think these practices will help you become a great fan of a bad team. It’s 2014. Get on those tablets and phones to follow what the experts are saying on Twitter while watching. To quote the brilliant Frank The Tank, everybody’s doing it. You see there’s plenty out there on the Internet, you just have to know where to look. I’m a competitive guy. Really competitive. I got in a fight with a friend over the board game Cranium last weekend. I was acting out Spongebob Squarepants but was denied points because I said Patrick and proper nouns are illegal. It was a whole big thing. Regardless, my competitive nature has me root really hard for my home team at all costs. 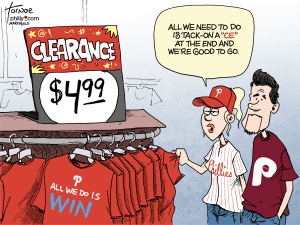 Even when the Phillies are 69-79 and 16 games back in the division I still want them to win really bad. 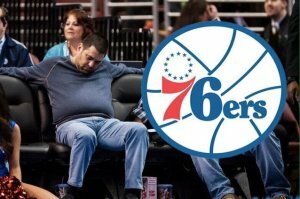 However, I find when watching the tank-arific Philadelphia 76ers I couldn’t care less if they win or lose because they’re supposed to be bad and are building toward the future. My brain is in a carefree, win-win scenario. The moral of the story? If your team stinks, own it. You’ll watch with a blissful smile as your team’s point guard throws a pass to a fan sitting in the front row, and your heart will thank you for it later. He told his wife he fell asleep. Dude was hammered. **Editor’s Note: Be warned – if your home team happens to be the New York Giants, your local game feed might not be the only thing that gets blacked out on Sundays. Play smart, kids. And for the love of God don’t do this at a bar when you’re driving home afterward. But if you’re bunkered in and looking for something to stop you from breaking the TV after another loss, this is probably your best bet. Feel free to root, root, root for the home team. Just remember if they don’t win it’s just a shame, not a life-altering experience. Give some of these cheering methods a shot as well; I think you’ll find you might enjoy the games a bit more and may live just a bit longer.